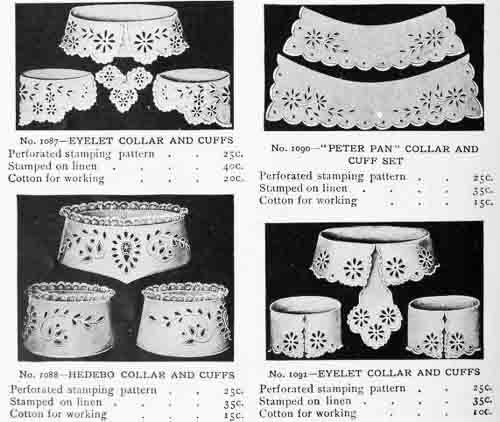 Most store-bought neckwear was expensive in the Edwardian era, so it was recommended to make lace jabots and collars at home with lace and fabric scraps. ‘Three girls were walking together through the shopping district, stopping now and then to look in at the most temptingly arranged windows. The displays of neckwear especially seemed to attract them as well as most of the other shoppers, for in front of these windows women were clustered as thick as bees around a hive. 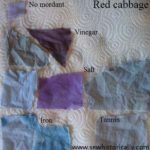 Six of the smaller medallions I pinned out flat on a piece of brown paper and then dyed or rather just painted them with thin oil color the same shade but much lighter than some scraps of old blue linen my sister had left from a last season’s dress. Then I painted narrow Irish edging to match the medallions and made a shaped stock collar and pleated jabot which are among the gems of my collection. 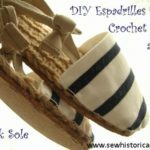 I found that very small linen handkerchiefs or hemstitched handkerchief centers could be made into dainty pleated jabots. 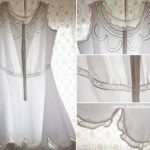 Some had embroidered designs in the corners and needed no other decoration, but into the plain ones I set strips of insertion and bordered them with lace. “No,” answered the other. “I use a fine cotton, No. 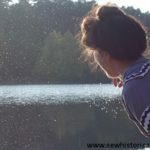 100 or 120, and a very small stitch on the machine, whenever I feel sure the effect will be just the same as with hand sewing, and it saves an enormous amount of time. 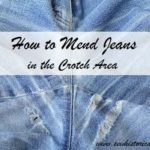 For instance, setting insertion into material is a laborious process by hand but I just baste it on, stitch close to the edge on both sides with my fine cotton, then slit the goods open underneath, crease it back on each side, stitch again directly over the other stitching and trim the raw edges close. This is just as neat as hand work and about a tenth of the labor. 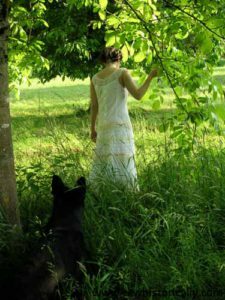 On a great many of my tabs and jabots into which lace was set I worked a little hand embroidery, dots or eyelets or a few tiny flowers and leaves; it took only a short time to do it, and the effect in every case was immensely improved. ‘Other things may in an emergency be slighted, but to a becoming summer costume appropriate collars, cuffs and belts are absolutely essential. 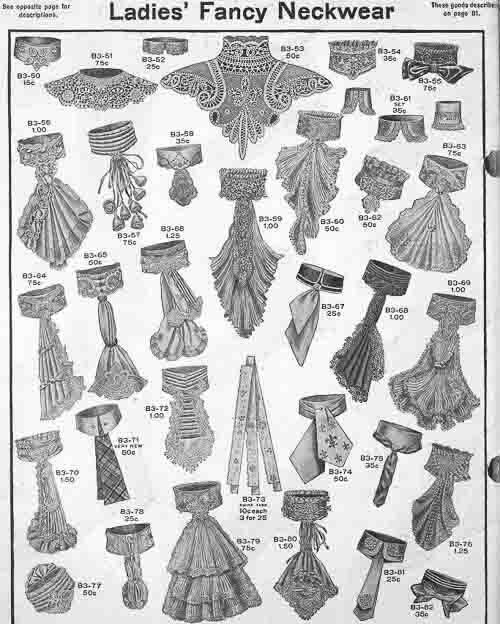 […] Quantity is as important, too, as quality, because collars wilting and drooping under the summer heat and tumbled cuffs looking as if they were two days old will go far toward spoiling the appearance of any costume. 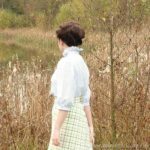 ‘Linen turn-over collars and cuffs are much worn this season […] To be effective, every portion of the work should be highly raised – that is, padded with filling-cotton. A black outline around each color adds much to the richness of that color. Twisted embroidery-silk is used for the edge, Caspian floss for the solid work of the design, and filo for the outlining. This design may be worked in colored cottons on a white or cream ground; or a blue ground may be used, working the design in white, with the outlining in black. 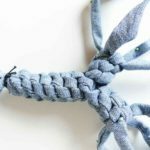 ‘Neckwear […] is one of the few articles that one never seems to have quite enough of and never the right one at the right time. The latest in the simple ones are made of gentlemen’s handkerchief and they are not only pretty but are very serviceable as well, which counts for a great deal these days. Buy a kerchief that has a border of some color, for instance a bright red or a pink, and by a little maneuvering you will find that the middle part can be cut out and that there are exactly four small seams to be sewed up and the tie is complete. 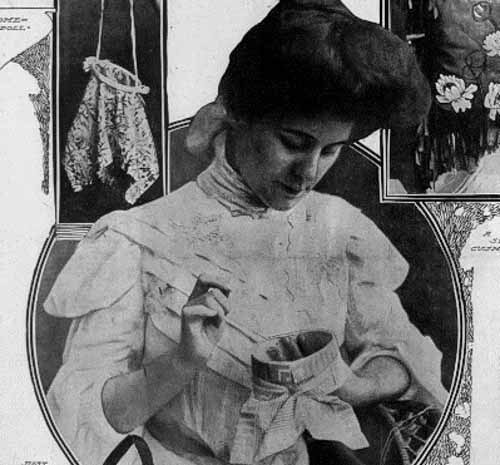 It takes at the longest probably three quarters of an hour to make, and as the material costs about 23 cent or 18 cents you can easily make a set of three’ (San Francisco Call, December 1903). ‘The new art collars and cuffs […] are made out of canvas, or denim, scrim or coarse linen. The coarser the material the better the result. 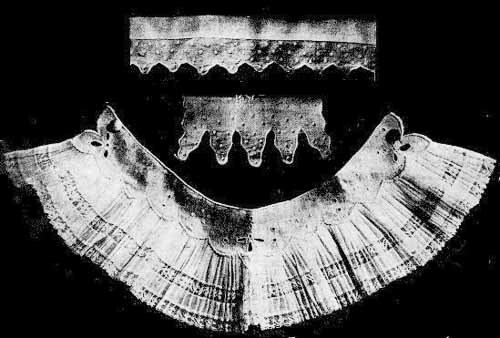 And they are cut in the shape of a wide turn-over band for the neck. And there are wide turn-over cuffs for the wrists. […] The collar and cuffs can be drawn with open work, if desired. But if open work is too difficult or too trying to the eyes, there are other ways of managing. 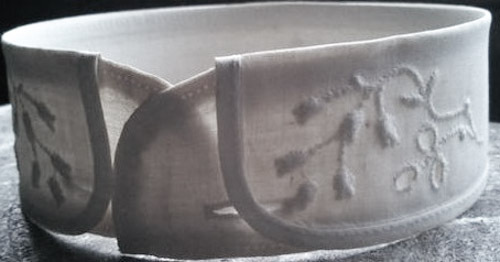 One lovely pair of […] cuffs is made of very heavy plain white linen, deep and beautiful in texture. 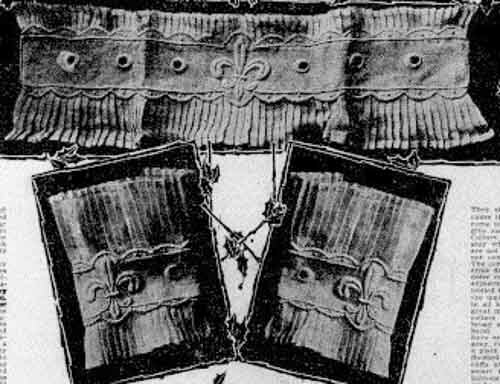 Around the edge of the cuffs there is wrought a deep border in the shape of an embroidered scallop, with a design below. This is done in a gaudy red, the brightest possible tone being chosen. The same is done for the collar. 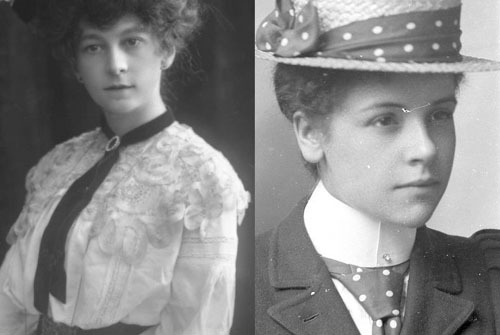 ‘The muslin collar is taking its place in summer dress, not the flat, wide collar which is worn upon the shirt waist suits, but the fluffy, flappy collar of silk muslin, trimmed with chiffon shirrings and decorated with knots of ribbon, frillings of satin, narrow fringes and what not, for its adornment. 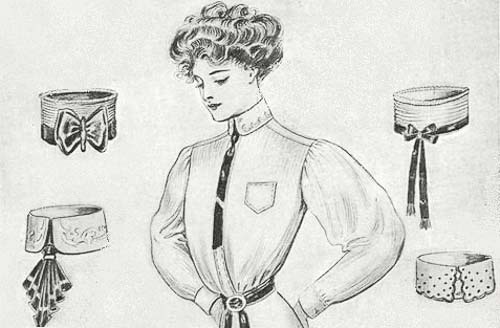 ‘Nothing finishes off a blouse or dress, and adds to its appearance more effectively, than smart and well-cut neckwear, yet to keep an unlimited supply of dainty lace jabots and collars always ready for use entails expense. 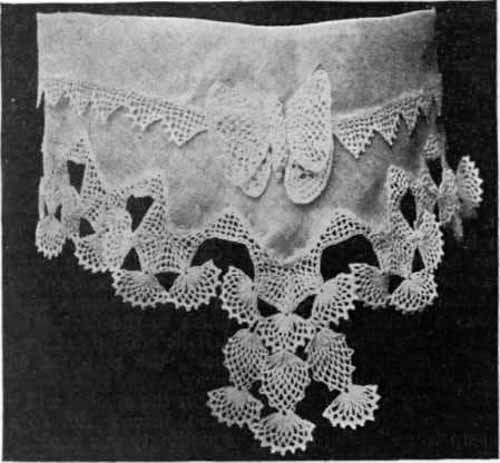 […] The collar shown here is made of clear, stiff muslin, and fine crochet work, which can be laundered as often as required, and will always look neat and pretty. 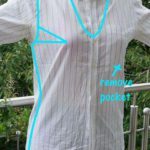 Most women possess a blouse or bodice with a high-cut collar. Take this, and cut from it a paper pattern, making it a little deeper all round, and with a wider centre frontage. 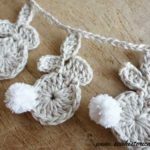 It is not necessary to be afraid of cutting it too deeply, as a large amount of the material is taken up when letting in the crocheted points. 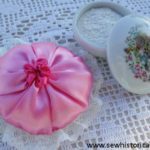 The materials for one of these will cost about 50 cents, and the value of the finished jabot will be several times that. 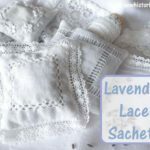 Quarter of a yard of wide lace and half a yard of the narrow will be needed for each jabot, and possibly these materials, or others that will answer, may be found among the odds and ends at home. 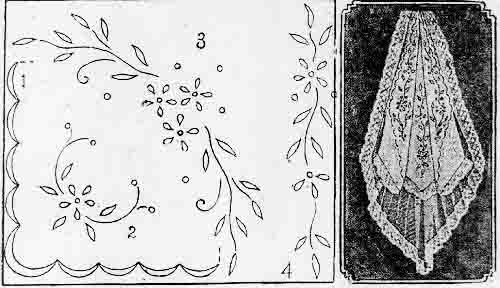 A great many of the most attractive jabots have an upper embroidered portion, and an under portion made of net and lace which comes down two or three inches below it, like the one shown in the illustration. Sometimes the upper portion is square and the lower portion pointed; sometimes the upper portion is pointed and the lower portion is square, or both upper and lower may follow the same outline. 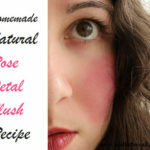 In this way one can get a great variety of effects from the same design or materials. 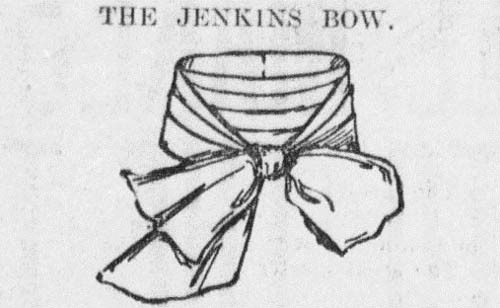 ‘With very little trouble and a small expenditure of time, the most charming versions of the fashionable jabots and collars can be made out of embroidered handkerchiefs. It is best to choose nice ones of real Irish linen, as the difference in cost is not considerable and the superiority of appearance is great. 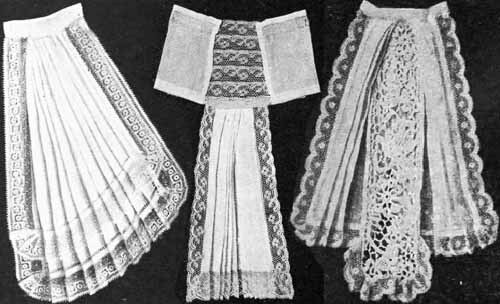 Sometimes lace-edged handkerchiets are used, at others it is better to purchase the lace and sew on the handkerchiefs as required. One of the simplest patterns to make is shown in the first illustration. A dainty little handkerchief of fine transparent Irish linen, with a very narrow fancy hemstitched hem, and a lace edge of uncommon pattern, is chosen for it. This is folded slightly on the cross, and cut with one piece about 1 1/4 inches deeper than the other. The pieces are laid one over the other, keeping the edges at exactly even distances, and tacked together with very fine cotton or silk. They are then pleated up in narrow pleats, tacked in position, and ironed. The tacking threads are taken out, and the pleats drawn together in a straight line at the top, and put into a narrow band of muslin 2 1/4 inches long. 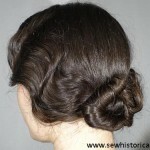 This will cause the pleats to stand out a little at the lower edge. They will need another pressing with the iron. Another very pretty jabot and collar (No. 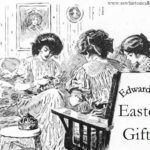 2) is made from an Irish linen handkerchief, with a narrow hemstitched edge, and a decoration of a line of drawn-thread work and border of embroidered shamrocks. Cut off a piece 7 1/2 inches in depth from the handkerchief to form the jabot. Edge this at the sides with narrow Valenciennes lace, and at the lower edge with a wider width of the same lace. Mitre the lace at the corners. 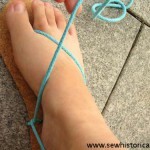 The wide lace should be 1 1/4 inches, and the narrower one five-eights of an inch in width. Fold the handkerchief in fine pleats, about five on each side, going towards the centre. Tack and press these in position, take out the tacking threads, overlap the pleats a little in the centre at the top, and put them into a narrow band of muslin about 2 1/2 inches long. 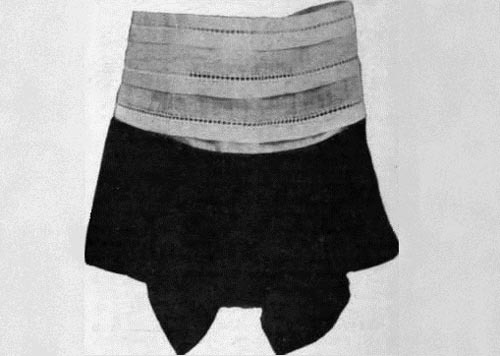 The remaining piece of the handkerchief is used to make the collar. It is cut in half, and the two points faced towards the front. 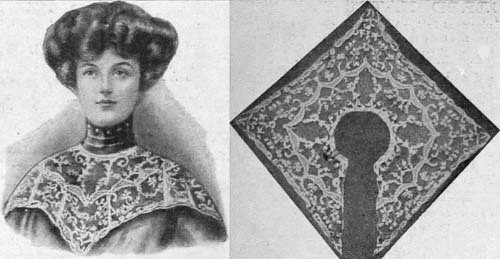 Several rows of the narrow lace are then joined together, and inserted between the pieces of handkerchief in front of the collar as shown in the illustration. The lower edge of the collar is hemmed and a support inserted at the back. I found this post so interesting, Lina. My mother used to talk about her father wearing detachable shirt collars but I never thought about women doing the same thing. 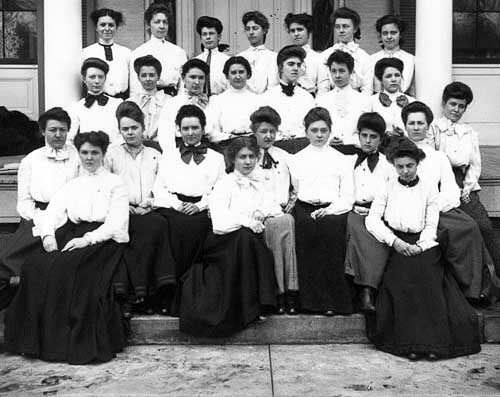 I was also fascinated by the variety of collars that women wore. 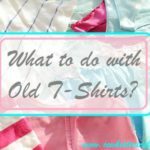 Thank you so much for sharing this post at the Hearth and Soul Link Party. I hope you are having a lovely week! Thank you so much, April! 🙂 Have a lovely week, too! 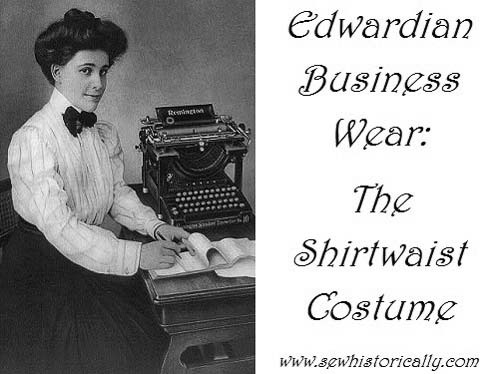 This is a wonderful piece of research on the Edwardian costume. I found it fascinating and interesting. thanks for sharing it. Oh dear, I want to make some of these now! oh this is a great post! 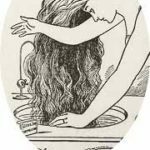 super informative–I love the Edwardian period! Thank you so much, Laura! 🙂 I love the Edwardian period too! This is really fascinating! 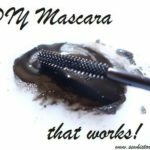 Thank you for sharing it with us at the Homestead Blog Hop! I love you information. 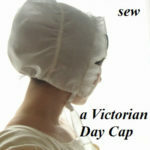 I sew victorian/edwardiam costumes for a 1895 Victorian home I volunteer at. Your page came up as I was looking on info on making a collar, Jabot for up coming event. I am also with the Costume Museum of Canada. I hope to read more from you. Keep up the great work. Thanks so much, Jeannie! I’m glad you found it helpful! Thanks for info. I need a steampunk collar, 2 weeks to create something. This has been very helpful.